Here is a small piece from the top shelf. In museum lingo, that means an object that is stored in an out-of-the-way location, in this case literally the top shelf of a tall shelving unit. Items way up there are difficult to see and examine, as it requires the use of a ladder to get close enough to see them. Like the Salon exhibitions of old, those things that are at eye level tend to get the most attention, while those that are closer to the floor or “skied” (placed high) tend to get only fleeting glances. I have glanced at this little church a number of times, and finally decided to brave the climb up the ladder to check it out more closely. As usual, I was surprised at what I found out. It’s a delightful piece of homemade folk art. Someone, probably a local carpenter, made this realistic little building around the turn of the twentieth century with simple but clever joinery, incising, and planing. It stands about 14 inches high, and has a hinge at the back to allow it to be opened. You can see from the slot at the apex of the roof that this was made as a donation box. It is badly painted, perhaps later than when it was made, but it is beautiful nonetheless. The story behind is a nice one too, and quite relevant to our museum. 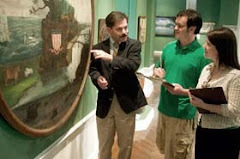 According to the donor, Donald Molloy of Fort Myers, Florida, it was given to him by his grandmother, Viola E. Smith Lance, in about the late 1970s. She had received it from the Matthews family of Cornwallville, New York in the early years of the twentieth century. According to her recollections, Mrs. Matthews was a wealthy woman from New York City who spent her summers in the Catskill Mountains. She was very devoted to the church in Cornwallville, and made it a habit to keep this homemade donation box on her porch during the week so her well-off friends could contribute to the church’s collection any time they visited her. The church Mrs. Matthews used this box to collect donations for? It is the very one now located at the end of the village green at The Farmers’ Museum. 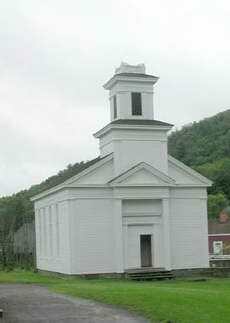 This building originally served a congregation in East Durham, and was moved to Cornwallville to serve the Methodist Episcopal congregation there, and was purchased by the museum and moved to Cooperstown in 1964. Along the way, the church collected more than money. It acquired a history, both tangible and intangible, that is still catching up with it today. This little piece of folk art way up on the shelf rightly belongs with our Cornwallville Church. Despite its size, the little donation box adds great depth and meaning to the church, and reminds us how every great historical survival is the result of many small acts of devotion. I love the stories. This church reminded me of the one my father had sitting on his television. Have a great New Year! Thanks! I'm glad you love the stories as much as I do. Have a great New Year! I love the top shelf & the stories often forgotten there. There's more to come. I spent an hour in storage and came up with nine new stories. Yeah!I can only imagine what new stories lie in wait for us from you on your exploration of the storage room. I am already inspired to poke around the top shelves here at home. Nice story Paul! At what point did you realize the model of the church was of the very same church that was moved to the Farmers' Museum? hi mary! this model is not actually of the church at The Farmers' Museum, but it was used by a congregant of the church to support its activities.